Jake Askham begins a short set of articles in which he will explain some general tactical principles. This first edition explores the Low Block. The low block refers to a defensive tactical principle in which a team defends from a very deep position on the pitch in order to restrict the amount of space the opposition has to exploit. Mourinho famously called this defensive principle “Parking the bus” and it is extremely difficult to score against a team using the low block due to the lack of space that is available in the central areas of the pitch. when using the low block. A low block is seen as a very negative tactic within football but there is a skill to implementing the low block. Where the likes of Pep Guardiola, Arsene Wegner and Vicente Del Bosque attempt to win a football game by dominating possession, managers who implement the low block are aiming to dominate the space on the pitch. Around 75% of goals are scored from shots within the penalty box, which means the main focus of defending should be to prevent the opposition’s players from receiving the ball within the penalty area. 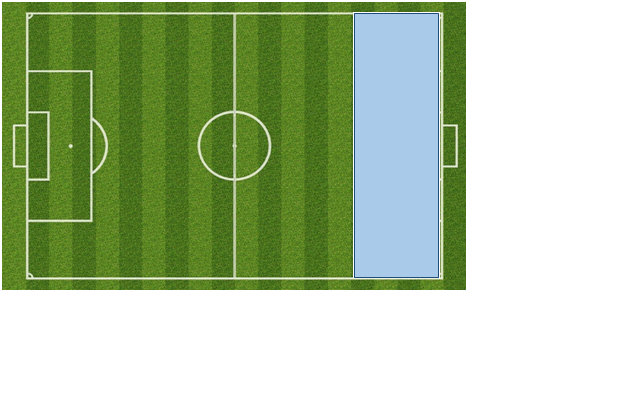 This means that teams will allow the opposition space in the wide areas and restrict space in the central areas. Managers such as Jurgen Klopp and Pep Guardiola attempt to win the ball in high areas of the pitch in order to prevent the opposition getting close to their goal. But managers who implement the low block are attempting to ensure they have a defensive overload in the key areas of the pitch. Who uses the low block? Pretty much every team in the world will use the low block at some point during a season. Some may use the low block as a last resort when the opposition are throwing men forward trying to get a last minute equaliser but some will use the low block from the outset. Teams often implement the low block from the outset when they are away from home in a game they feel the opposition will dominate the ball. Under Diego Simeone, Atletico Madrid have become experts at implementing the low block successfully. The system has allowed them to compete with the likes of Real Madrid and Barcelona despite them not being able to compete financially. Under Simeone, Atletico have won La Liga, Copa Del Rey, Europa league and competed in 2 Champions League Finals all in the space of 5 years. Simeone often employs a narrow 4-4-2 formation, with Griezmann playing behind the lone striker. The two banks of 4 then provide an excellent foundation for the defensive phase. They aim to prevent the opposition from playing into the central areas of the pitch and therefore their body position reflects that. Notice the body position of the two players circled and the space given to the Bayern player who is closest to the touchline. Again, notice the lack of space in the central areas for Lahm to pass the ball to. Filipe Luis recognises that the most pressing danger is the player over his right shoulder, so his body position reflects that and is ready to move towards him if needed. 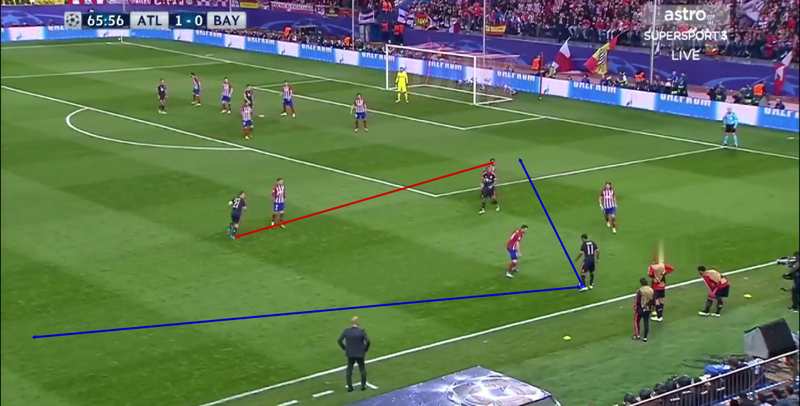 This then leaves Lahm with the simple option of passing to Douglas Costa who is circled and against the touchline. The ball is then played to Douglas Costa, who is predominantly left footed and wants to cut inside and drive at the opposition. But Koke’s body position is showing him down the wing and onto his right foot and away from the danger which is the middle of the pitch. 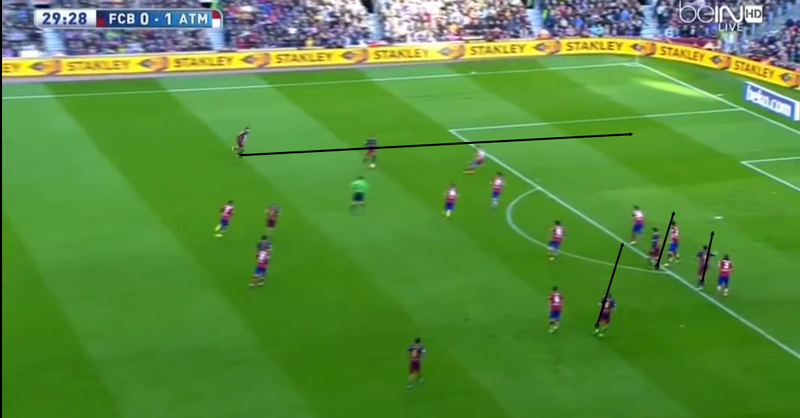 Look how deep the defensive line is for Atletico too, the distance between the two centre backs and the goalkeeper is minimal which means the chance of a cross being received on the 6 yard line (the area where most headers are scored from) is minimal. Finally, look at the 4 v 3 overload that Atletico create. The numerical advantage means that it would be extremely difficult for Bayern to pass their way past the Atletico defence in order to get in behind the defence and into the penalty box. This leaves Douglas Costa with two options. He can either play the ball back towards his own goal or attempt to play a pass into the space where Lahm is attempting to run. Atletico have created a situation where Bayern have to score a truly fantastic goal in order to break down the defence and have positioned themselves so there is no ‘easy’ way for Bayern to score here. As soon as the Atletico defenders see the run of Lahm and Douglas Costa’s foot raised just before he plays the ball, they move across to cover the run and to defend the penalty box if Lahm does manage to receive the ball. The ball is played to Lahm by Douglas Costa. The defensive line drops even deeper to cover any cross that may come into the box. Atletico’s LCB puts his body into a position that prevents Lahm from getting to the ball and the ball goes out for a goal kick. Another point to be made here is the positioning of Griezmann who is in the black circle. He is their primary goal-scorer, but he is defending within his own penalty area. This incredible defensive work rate is one of the main reasons Atletico have been extremely successful over the past 5 years. How to play against the low block? When a team is using the low block, they will naturally defend the central areas of the pitch. This means that there will be spaces in the wide areas that a team will be able to exploit. One of the reasons Barcelona have been so dominant over the last 10 years is their ability to break teams down and one of the ways they managed to do this was the quick interchange of passing in and around the penalty box. Players such as Iniesta, Messi, Neymar and Suarez are able to play with such a tempo that the opposition simply can’t get into the correct positions to defend. Neymar receives the ball in a dangerous position and immediately Jordi Alba provides the width and goes on the overlap. Jordi Alba receives the ball in a dangerous position. However, Messi and Rakitic have both positioned themselves in pockets of space despite being heavily outnumbered. One key thing to notice is the where the Atletico Madrid defenders are looking. All of them are looking at Jordi Alba and no one is looking at Lionel Messi which means if the ball is played into that area he will be able to get a shot off. The ball is played into a dangerous area by Jordi Alba and Messi scores from this position. Notice there are 9 defenders (including the goalkeeper) in the penalty box, yet he still manages to find space within the box. This is a classic example of how to attack against the low block. Like any tactical principle, the low block has its strengths and weaknesses. Over the last 10 years we’ve seen teams achieve enormous success by utilising the low block when defending and despite it not being the most aesthetically pleasing style of play it can be extremely effective. 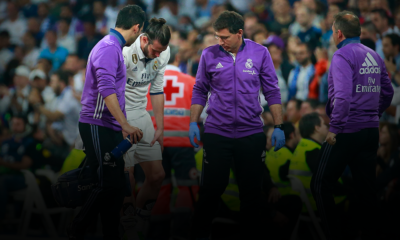 The low block has given Atletico Madrid a method of competing with Barcelona and Real Madrid in La Liga, and this can only be a good thing. Chinese Super League: Failed Experiment or Foundation for Success?